In 1916 Britain’s Army Council authorised the Middlesex Regiment to form two battalions (the 30th and 31st) formed from recruits who were naturalised British citizens but of enemy alien parentage. Most of the men were of German ancestry and of low medical grade and the most members of the battalions stayed in England for the duration of the war. Rather unkindly, the units were generally known as ‘The Kaiser’s Own’. An extract from Hansard for 15 March 1917 reads: ‘Mr King asked the Under-Secretary of State for War whether he is aware that the 30th Battalion Middlesex Regiment is composed of men the sons of alien enemies; that many fathers of these men are interned as alien enemies and their brothers and relatives are in some cases lighting in the enemy armies; that these men have German names, converse in German, and sing German songs, and that when enlisted they were assured that they would not be asked to bear arms against their kith and kin. 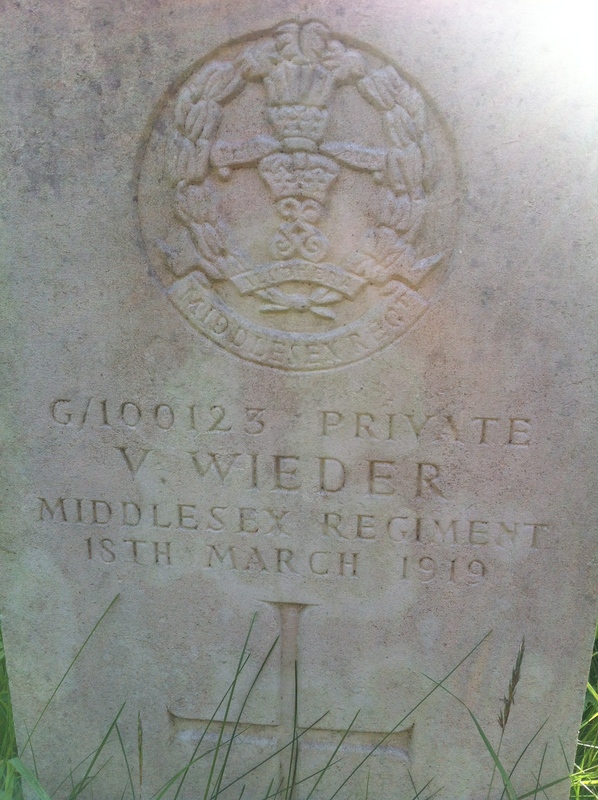 One of the 30th Battalion’s soldiers, G/93219 private V (John according to his medal index card) Wieder, is commemorated in Hampstead Cemetery, London NW6. His gravestone, sadly, is now rather overgrown. This entry was posted in Events and tagged 30th and 31st Battalions, Centenary of the First World War, enemy alien, Hampstead, London, Middlesex Regiment, news, private John Wieder, the Kaiser's Own, UK News. Bookmark the permalink.